Will the Icelandic volcano affect the World Championship? 4/17/2010 – Just after landing on a stopover in Frankfurt, World Champion Vishy Anand was informed that all further flights were cancelled, owing to volcanic ash from Iceland. With 25,000 flights cancelled per day, hundreds of thousands of travellers, including Anand, are stranded, with alternative routes (rental cars, trains) almost impossible to arrange. The AICF is seeking a three-day postponement. Last Thursday World Champion Vishy Anand took a flight from his home in Madrid, Spain, to Sofia, Bulgaria. He and wife Aruna had a stopover in Frankfurt, Germany, with an ongoing flight to Sofia the next day. No sooner had they landed in Frankfurt, however, than word went out that all further flights in and out of that airport were cancelled. 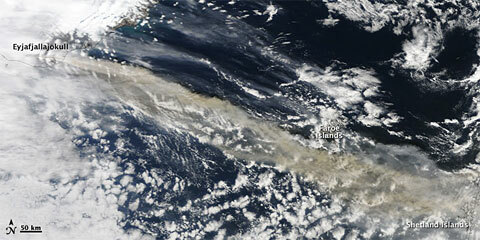 This was due to an ash cloud which emanated from an Icelandic volcano and had drifted into European airspace. Slowly one airport after another was closed down, until on Friday all the major European airports (and all in Germany) had come to a complete standstill. The volcano causing all the trouble is located under Eyjafjallajökull, one of the smaller glaciers of Iceland. The volcano itself is 1,666 metres (5,466 ft) in height and has erupted relatively frequently since the Ice Age. There have been three previous major eruptions in olden times: in 920, 1612 and from 1821 to 1823. Previous eruptions of Eyjafjallajökull have been followed by eruptions at its larger neighbour Katla. The pronunciation was explained to ABC New’s host George Stephanopoulos by Erla Skuladottir of Iceland. You can hear how other Icelanders and international reporters pronounce it here. There are some really spectacular images of the volcano erupting on this site. The explosive eruptive phase of the Eyjafjallajökull volcano began on April 14th, with a new set of craters opening up under the volcano’s ice covered central summit caldera. The ash-loaded eruption plume rose to more than eight km in height, and was deflected to the east by westerly winds. Since the eruption occurred beneath glacial ice the volcanic lava was chilled quickly, causing it to fragment into small glass particles which are carried into the eruption plume. The glass-rich plume is now floating in the upper atmosphere at up to 50,000 feet, exactly in the airspace used by commercial aircraft. It is very hazardous for these planes, since the particles are melted in the jet engines and tend to clog the blades. In the past a number of aircraft have lost power when flying through such volcanic clouds. Most of the nearly 30,000 flights which normally take place on a Friday or the weekend were cancelled, causing absolute mayhem across the continent. All 16 German airports were closed. Naturally with hundreds of thousands of passengers stranded it is almost impossible to make alternative travel arrangements. We tried calling Lufthansa, and just the wait on the phone was over an hour. Even when you reach the carrier little can be achieved. If you are lucky you are put on a later flight, but of course that is usually cancelled. One of our family members is stuck in Ireland, and it looks as if the delay will be from Friday until Wednesday at least; Garry Kasparov and his wife are in New York, unable to return to Russia (the flight route would take the plane through the cloud); the German national chess team is stranded in Vietnam, and even Barack Obama is unable to attend the funeral of the Polish President Lech Kaczynski and the 95 other victims of last weekend’s plane crash in Russia. Travelling from Frankfurt to Sofia by other means is hardly less daunting. Car rentals are completely booked up, as are trains, which are totally packed. A train journey from Frankfurt to Sofia would take 28 hours. Anand’s wife Aruna has spent considerable time trying to find a reasonable way to reach the Bulgarian capital. These efforts continue, as there seems to be no end to the crisis in air traffic. 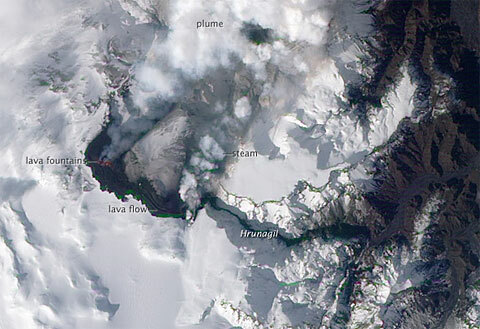 The Eyjafjallajökull volcano is still erupting, and possibly intensifying, with the ash plume rising to 30,000 feet. Evidence of ash dust over the UK is being detected by Met Office observations and there are reports of dust reaching the ground. The Met Office commissioned NERC research flight flew over the North Sea on Friday afternoon and detected three distinct layers of ash, from fine particles at low levels to large particles around 8,000 feet. The All India Chess Federation has sent an urgent message to FIDE seeking postponement of the Anand versus Topalov World Chess Championship match, which is scheduled to start from April 23, 2010 in Sofia. The AICF Honorary Secretary D.V. Sundar has sent an urgent message requesting the FIDE President Kirsan Ilyumzhinov to intervene and postpone the World Title match to allow time for the defending champion Viswanathan Anand to reach the venue. Anand is unable to fly to Sofia as flights in Europe are cancelled. The ash from the volcanic activity in Iceland has stranded passengers all across Europe and Anand is stranded in Frankfurt. The AICF letter requests the intervention of FIDE President and requests the match be put off by at least three days. The match is a best of 12 and in case of a tie it will be decided in a rapid playoff by May 12, 2010. "In view of the extreme force majeure situation we are facing, it has become difficult and near impossible to travel in Europe. We are working with the FIDE supervisor to see how we can travel at the earliest. Given these circumstances it has been agreed, keeping in mind Vishy's arrival in Sofia the schedule could be moved accordingly. We wouldn't want to speculate on rumours at this point and will try and arrive at the earliest." – Aruna Anand, wife and manager of World Champion Viswanathan Anand. Greetings from the All India Chess Federation. We write to seek your kind intervention in postponing the Match between Grandmaster Vishy Anand and Grandmaster Topalov by at least three days. As you are aware, the Volcanic Ashes across Europe has rendered many passengers sulking in various Airports across the Globe, more particularly in and around Europe. Anand and his team could not reach Sofia on 16th as planned and are in transit & held up at Frankfurt. I understand that they are frantically trying to reach Sofia as early as possible so that the schedule is not disturbed. However, this being an important match it will only be fair to Anand that he is not made to play the first round amidst such tension. He needs at least three to four days of acclimatization before he starts his defence of his title. I understand that Anand has already appealed to the authorities as per the Rules Governing this historic Match. I am sure you will see reason and take a proper and just decision in the matter and help to bring in equal playing conditions to the player. We await your immediate action and response in the issue. The time controls for the Anand-Topalov match are 120 minutes for the first 40 moves, 60 minutes for the next 20 moves, then 15 minutes for the rest of the game, with an increment of 30 seconds per move starting from move 61.
the ChessBase commentators covering the match. You can listen to their commentary on the the chess server Playchess.com. If you are not a member we adivse you to download the free PGN reader ChessBase Light. This program also gives you immediate access to Playchess.